The album begins with the gnawing regret of “It’s Too Late,” and every song Chapman sings thereafter directly references the passing of time—its blind ruthlessness, its sweet hazy delights in noirish language almost mystical in its terseness and precision. (The two transportive, gorgeous instrumentals, one per side, both have appropriately evocative—though decidedly not Northern—pastoral place names for titles: Eleuthera is an island in the Bahamas where Chapman habitually holidays every winter, and Caddo Lake straddles the border between Texas and Louisiana.) This is Chapman at his darkest and most nocturnal, yes, but also his most elegant and subtle, squinting into the black hours with an unseen smile. 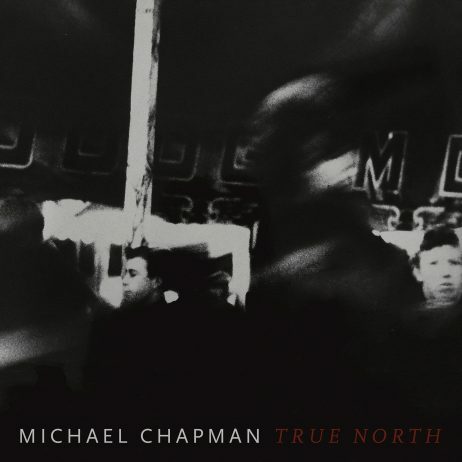 By the time True North is out in the world, Chapman will be seventy-eight years old and will have released nearly as many records, a staggering achievement. True North represents the most nakedly personal album of his career, his most authoritative, unguarded, and emotionally devastating statement. His universally celebrated full-band 2017 album 50 flirted with much-deserved triumphalism, offering a retrospective of his illustrious career, revisited in the company of the fellow UK song writing hero Bridget St John and a rowdy gang of younger acolytes including Steve Gunn, James Elkington, and Nathan Bowles. The production hearkens back to Chapman’s classic Millstone Grit (1973), as well as recalling Bob Dylan’s Time Out of Mind (1997); True North shares something of that album’s spectral gloaming, midnight heartache, and sly, self-knowing winks. Compared to 50, these recordings feel narrower in range, less overtly narrative and dynamic and more impressionistic and restrained, but they are correspondingly more piercing and arrow-like in their rending impact, more concerned with an archer’s deadeye aim than pyrotechnics. Whereas 50 featured two new songs among radical reinterpretations of material from Chapman’s deep catalogue, True North includes twice as many new numbers among its quiver of eleven arrows—“It’s Too Late,” “Eleuthera,” the fiery “Bluesman,” and slow-rolling album centre piece “Truck Song”—confirming the exultant return of Chapman the songwriter. The other songs were selected from various obscure corners of Chapman’s vast catalogue (“Youth Is Wasted on the Young” was previously recorded with Thurston Moore and Jim O’Rourke for a compilation, for example.) In these renderings they receive their definitive treatments, utterly transformed. FORMAT: LP: Limited Red wine coloured vinyl (POB044LPC1) is for Cargo Collective stores only. LP on 140g virgin vinyl include a download code.